Monday, June 20 at 7:00am - July 2 at 10:00am. From Rte 1 in Fort Kent to Kittery. See the website for details on this one...there is more to it than meets the eye! Bring your geowonderdog and enjoy this event! This month we are continuing our contest for the best caching picture. We have had a few beautiful entries, some funny entries, some creative entries, and some...well...okay, some were just weird. But no matter beautiful, funny, creative, or weird, all are welcome, and we need more. Remember, next month the top three pictures will be featured in this newsletter. Our subscription base is growing, so literally dozens of people will see that YOU won! In addition to the top three being recognized here on our digital pages, we will also have a heading in the photo gallery called "Newsletter Photos" where all the entries will be posted. The new gallery file will not be posted until the July newsletter is published, but it will have all the wonderful entries we have received for everyone to enjoy. This is your newsletter and we need your participation to make it wonderful time after time! (Trust me folks, I will run out of ideas quickly!) Get Involved--Get Caching! Warmer weather is finally here - YEAH! Okay, don't get too excited. This is Maine and soon it will be cold again. Did you know GeocachingMaine.org has some lists that can help you to get the most out of your summer? No, you didn't know? Well, let me tell you about it. Caches Near Interesting Bridges on our website is a great resource if you like the "man-made" wonders Maine has to offer. Did you know Maine has lots of covered bridges, suspension bridges, and just cool-looking bridges? Better still, this list gives you all the caches near them. Way cool, huh? Perhaps your taste runs to the more natural wonders of this state. 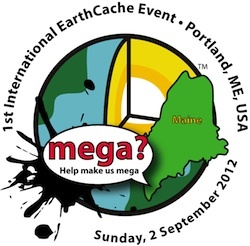 GeocachingMaine.org may have just what you're looking for. 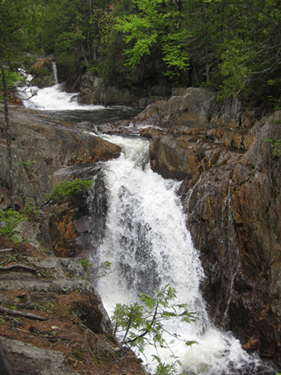 Waterfalls in Maine with Caches will take you to some beautiful places. Some of these waterfalls are rarely seen and some are regular tourist traps, but either way they are great fun. So, you say, "I looked at these lists and I know of some caches near bridges or waterfalls that are not listed here." Send those thoughts to Brdad. He is in charge of keeping those lists updated but there are only so many hours in the day; if some are missing, let him know so they can be added and enjoyed by everyone. 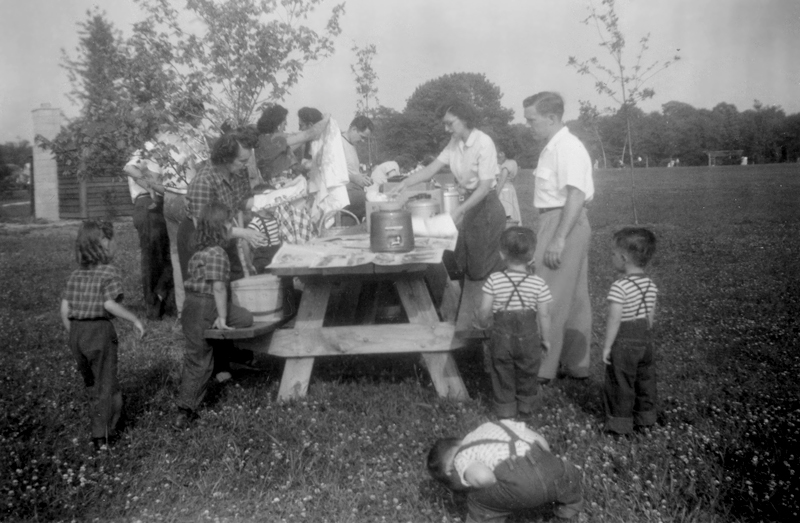 Here is a good idea: pack a nice picnic lunch using some of the recipes you found on the website recipe section and plan out a trip around some of these intresting Maine sites. What an awesome family fun day or perhaps a whole weekend of fun that would be. Here at the newsletter HQ's (that's my livingroom couch) we have been thinking. Yes, there was a lot of smoke. But after that cleared away, we wondered if we were providing the type of content you cachers out there are looking for. If there is something you would like to see featured, mentioned, discussed, or even a poll question - send it along. We are always looking for new content ideas and guest article writers, too. Currently we are looking for people who cache with their children. We would like to do a story about kid caching but other than a few trips with my granddaughter, I don't have alot of experience in that area. So, if you would be willing to answer a few questions about caching with your kids please PM me so that I can send you a list of questions to help form this future article. Thanks for being a part of GeocachingMaine.org and "The Ammo Can." 9 why we do it. EarthCaches - What are They? By now everyone in the State has heard that we will be having a mega event here in 2012. 1st International EarthCache Event is sure to be a great time. Now I know that not everyone has actually done an EarthCache, myself included, so I thought it might be nice to know just what an EarthCache is. So I asked one of the more prolific EarthCache hiders in the state to explain it to us. Northwoods Explorer was gracious enough to be our first guest columnist. Special thanks to him. We all know what geocaching is all about; it is the hunt, the hide and discovery. It is known by many as a worldwide adventure game that involves the hunting for caches with a GPS. The details about the location and the cache itself are located on the Groundspeak webpage. The individual finds the cache and signs the logbook and then moves on to the next cache. EarthCaching is another type of geocaching where the individual finds the information on the same webpage and then uses the GPS to find the location. The location is a special place that people can learn about a unique natural feature or aspect of our Earth during their visit. Once at the location this is where there are some major differences from the traditional cache. The EarthCache is a type of virtual cache with no physical container or logbook to sign. The reward is not a trinket but learning something about how the geology of a location has shaped the landscape or how we have make use of one of the earth’s natural resources. The EarthCache sheet contains educational information so that the user will leave the location with a better understanding of what they are seeing. 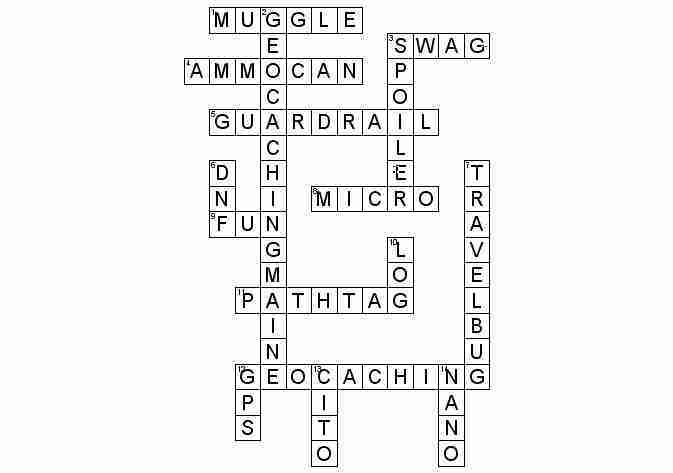 The sheet is generally written so that it can be understood easily by the average geocacher. Proof of the visit comes in the form of a better understanding while logging proof comes from answering a few educational questions used to reinforce the lesson so that you will have truly learned something from the experience. To claim the cache as a find, you must use the information given and do a bit of investigative work to answer the questions. One of the great things about EarthCaches is that they are allowed in locations that would normally not allow a traditional cache. Baxter State Park has welcomed EarthCache involving them in their annual report but does not allow traditional cache as it leaves something, which they do not allow. The Nature Conservancy has taken a positive view of the development of EarthCaches on their properties. So EarthCaches are being welcomed in many locations where the traditional has not been allowed in the past. For us, we like to go geocaching by bicycle and will often stop for a cache or two as a break. When we started geocaching we did it for the discovery of new and unique places that we would have otherwise never found. While the face of geocaching has changed as numbers and cachers have increased, it has changed from discovery of the location to discovery of the cache for us. What EarthCaching has done for us is bring back theexcitement of the discovery of a location. The EarthCaching will take you to special location that has been discovered by someone with knowledge of the natural feature and gives a description of the forces involved in its formation. We have been luck to do some very exciting earthcache locations, one took us down a back alley in Fredericton to where various rocks were used to construct a building, any other one took us to a rock cut filled with fossilized plants, while an other one explained how the river had been changed by a flood several years earlier - moving a house from one side of the river to the other. We have done EarthCache locations that were extremely remote where you suddenly pop out into one of those “Oh, Wow” locations. We have done EarthCaches where we did not have to leave the car as you could reach out the window and touch it. Yes, there are bad EarthCaches just as there are traditional caches that you sometimes wonder why you did them. But with EarthCache locations these have been few and far between for us. EarthCaches are not for all geocachers as they really don’t help your numbers but for some it is a new adventure. Either way, when start doing EarthCaches and you drive down the road you will never look at the countryside in the same way. The more you do the better you will understand your surroundings. EarthCaching does indeed capture the spirit of the hunt for a treasure but the treasure is an act of learning and an appreciating something new about our magnificent Earth. So think outside the box and give EarthCaching a try! 7th Annual Penobscot River Clean Up CITO was a great success. This year there were ten cachers in attendance. They included Brdad, Msteelee, Hiram357, Hollora, TAT, Parmachenee (2), Genie Cache, 104LL were there with the cachers and Fick Fam was there with the Brewer firefighters. Together with the dozens of other participants (usually between 200 and 300) from many local organizations, thousands of pieces of trash were picked up and properly discarded, and in the six years prior around 24 tons of trash have been collected. This event is held every year and each participant not only gets a breakfast which consists of coffee and donuts and lunch of burgers, hot dogs, chips, and cookies provided for them, but they also are given a tee-shirt, and all the trash they can carry! Although, I don't think too many people took too much of that last one home. Mark your calendars for next year and plan to attend this special event. Thanks to these cachers and other civic-minded people, the Penobscot River is a much more pleasant place to walk and cache. Here is a picture of the getting ready to work scene that morning and a few of the cachers enjoying their coffee before starting out. 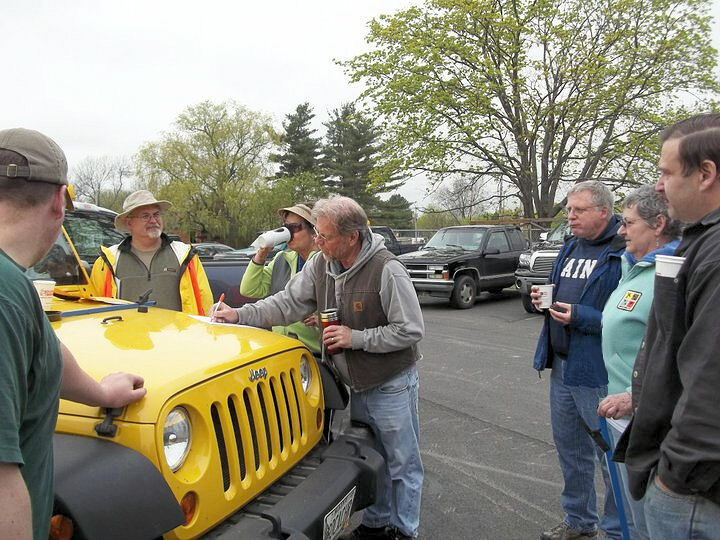 (So, did everyone autograph the jeep?) Thanks, Hollora, for this photo. This brings me to another thought. It you have an event, take pictures, write some notes, and send them my way. I would be happy to write up a little something about your event to help promote it or just to let folks know what a super time you had. This month's poll was sparked by a discussion in the Geocaching Maine chat room. If you haven't gone there on chat night, or any evening for that matter, I highly reccomend dropping by a few times. The link to join the chat can be found on the front page of our website and it requires no special setup. Here is this month's poll question: What one item do you HATE to find in a cache? You may have more than one thing you don't like, but we would like you to pick the one thing you think is the worst to find in a cache. If you choose "other" please drop a note on the thread to let us know what that item is. I think that a lot of people new to the sport don't know what types of things are acceptable and what types of things are real "no no's." Maybe this poll might help clear things up a bit for them. What one item do you hate to see in a cache as SWAG? 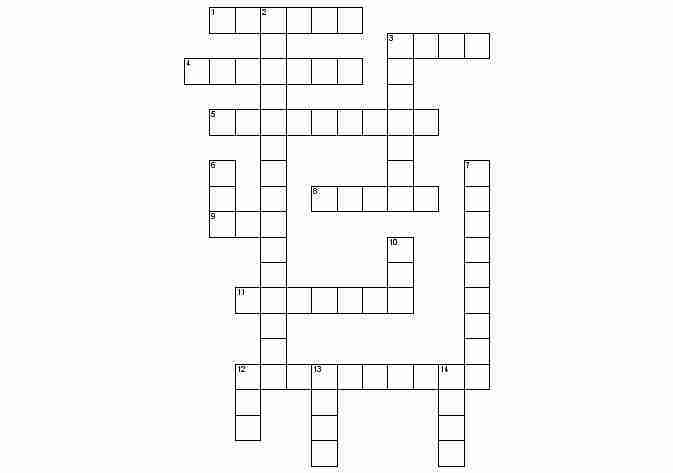 Here is something for you to work on till next month when we will have the answer and hopefully another question for you. How many night caches are there in the state of Maine? Not those with a 24 hour attribute mind you, I mean those designed to be done at night. If you're not sure what a night cache is check out this thread recently found on the web site about fire tacks. It takes you to a very informative article on the subject by a neighboring Canadian cacher teamvoyager. You may opt in or out of future newsletters by editing your "Permission Groups" in your account settings on the Geocaching Maine website or click here. If opting in, you must also ensure the email address in your profile is valid. Your email address will not be shared with anyone.